The SSTB-3500 Skid Steer Crane Boom lifting attachment is ideal for lifting or moving objects such as balled trees, bundles of material, or equipment on the job site. This skid steer lift attachment features three lifting points for increased flexibility in loading and lifting. All welded steel construction for long life. Boom utilizes 3" square tube stock providing strength and durability. View our literature. • Has hree lifting points for increased flexibility in loading and lifting. 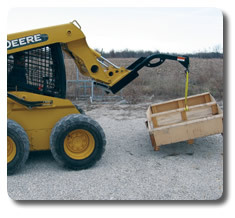 • Ideal for lifting or moving objects on the job site.